Rather than continuing to add additional posts on my age old Transatlantic play set for Fiasco, this will serve to warehouse notes and callbacks to Transatlantic out in the world. Updating periodically when i’m feeling particularly vain and have too much time. • Transatlantic has a page on Boardgame Geeks. Plenty of links and overviews. Leave a rating if you like it. 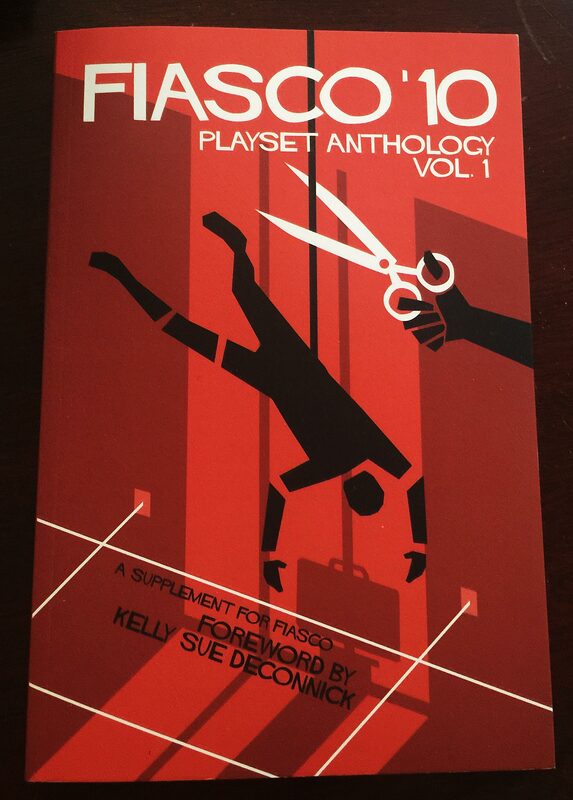 “Transatlantic was the first playset for Fiasco that I played which was not found in the main book. It was a play-by-forum game and sadly petered out, but the setup was fantastic and I suspect that in real life, it could be excellent. The style of the playset is outstanding; it begins by demanding that the most aristocratic person at the table read out the opening. This further sets the tone for the rest of the game. The elments are a cunning mix of the outrageous (Intrigue: Who are you and why are you in my closet?) to the seemingly mundane (Need: To Escape: From prying eyes). Wrapping them together is enjoyable and easy. It also results in a feel not dissimilar to the films on the movie night list – Titanic, with its odd and over the top subplots; the Posideon Adventure, with an unlikely group thrown together by fate even Duck Soup, with the Marx Brothers’ wackiness, is acknowledged. Transatlantic was also the first playset I knew to use flashbacks in its setup, with locations like ‘Sweethearts’ first meeting’ referencing events before the game by design. It also contains such gems as the requisite homage to Lovecraft (Object: Sacrificial dagger with engravings of the loathsome Sea God ). • BGG has an interesting Play-by-Forum Fiasco thread including Transatlantic. Interesting to see Fiasco unfold over forum as the narrative shifts a bit. This particular session is notable as being the most boat-y of the Transatlantic sessions I’ve encountered. It may be that the text element is conducive to fleshing out the setting; in a similar way that verbal trends towards ‘character’. 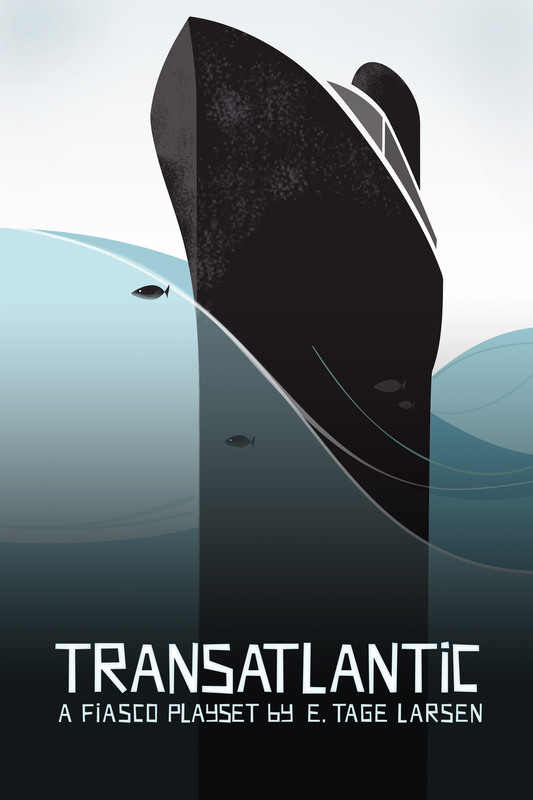 Earlier threads on Transatlanctic, including AP and summaries can be found: here. I was at Dreamation the other week and it was my first opportunity to finally pick up the Fiasco playset supplement book that contains my ‘Transatlantic’. The Bullypulpit boys did a wonderful job with the book, and the subsequent Fiasco books as well. Happy to have this finally in my library. 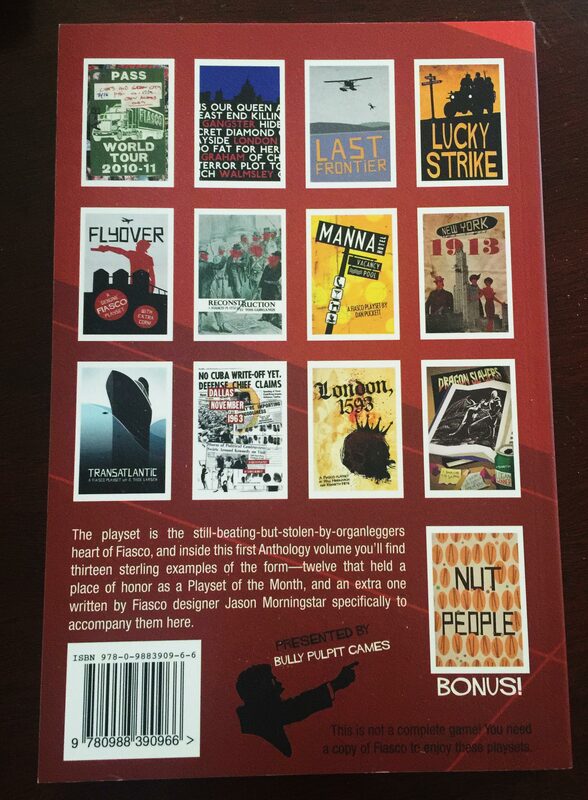 IMHO, this book contains the largest collection of the most playable scenarios for Fiasco; and is virtually mandated for a swath of play. My best to Steve and Jason. I’ve rounded up some more Transatlantic Actual Play for my Fiasco playset. Below is a link to a game at Gencon in 2011 that just found itself to me. Lastly, Analog Game Studies (Felan Parker) writes up a really well thought paper on Fiasco. They mention Transatlantic as a sample playset. It’s incredibly satisfying to see and hear other people enjoy something that you’ve sent out there into the world. Thanks. Play on! The best part about game design is feedback: that people play the things you create and enjoyed them. Because of the magic of the internet, some of these people post accounts about play sessions or recorded actual play. Here are a few posts about feedback on my playset for Fiasco, “Transatlantic”. … love the mangled voice over and labored vocabulary, apologies for that. sounds like you guys had a great time. As a side comment, many thanks to Jason Morningstar for Fiasco and for Steve Segedy for his stewardship of Bully Pulpit Games. Fiasco playset of the month “Transatlantic” available as a free download from Bully Pulpit here. Additional Transatlantic playset notes for my Fiasco supplement. It’s going to be a strong year for floating disaster! There’s been a run on Transatlantic the past few weeks! Great to see. Is it because of all the Downton Abbey on the BBC/PBS or perhaps it’s because 2012 is the centenary of the sinking of the Titanic? Chris Bennett: I played a 17 year old tomboy from Texas named Sadie Hawkins who had a crush on a young German bride but accidently stabbed her with a cavalry saber. Oops. Mia Blankensop: See how mournful I look? I was a German, orphaned, staunchly Lutheran teen bride. In the thirties. Sean Nittner: I was a French WWI veteran sailing west with my new (or soon to be) bride. But in this picture it just looks like I have TMJ. Fun times! Brian Minter offers the following AP from a housecon he threw for his friends. We played Transatlantic! It was a good one. Thanks for the recent spate of Transatlantic love! Kevin Mowery submits the first actual play with the Transatlantic playset that I created for Jason Morningstar’s Fiasco game. 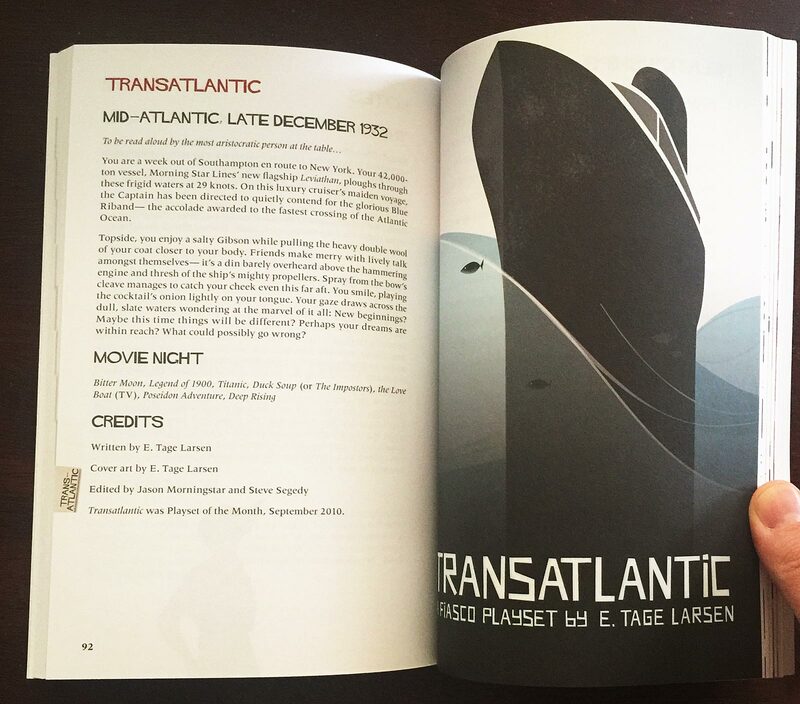 Today, a playset I designed for Fiasco, “Transatlantic” was released as the September Playset of the Month.